Bag-in-Box and PET tank: fruit juices for breakfast, hotellerie, and catering. We can provide our customers a wide range of natural Post-Mix juices & water solutions for their breakfast outlets. 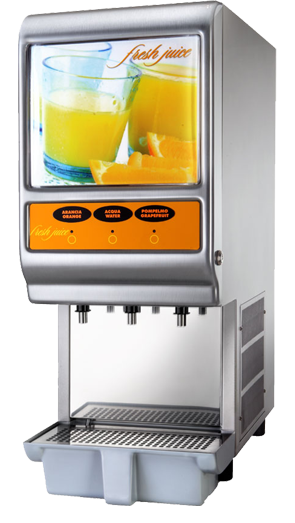 Using our top of the range over the counter juice machines can fully meet your demanding breakfast outlets, providing you a refreshing morning juice made from concentrate and pulp at a push of a button, using the ECO –friendly technology making it a the same time, simple of use for the consumer as the juice is prepared at the moment and is always fresh.